Any ideas how to fix this problem? Emx model is correct. Here in the attachment you can find the model. Thanks! I forgot to mention that I am trying to implement reading .emx model as standalone java application in IntelliJ. Is there such a plugin for IntelliJ? Can you share a link for the plugins that you mentioned? Thanks! As mentioned earlier, this plug-in covers several aspects required for importing RSA-RTE models in Papyrus. The first step was to be able to read the *.emx models, which is achieved via custom Ecore metamodels and adding specific content-types, so that Eclipse/UML2 can recognize these models as UML2.3 models (And migrate them to UML2.5). This is probably the part that you'd want to reuse. 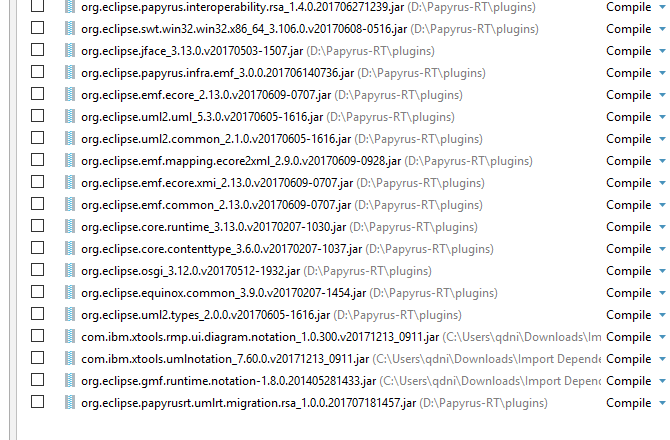 org.eclipse.papyrus.interoperability.rsa jar is the first one in my dependency list in java project and this is the module I started from. Basically, I tried to reproduce import of RSA-RTE model (org.eclipse.papyrus.interoperability.rsa.wizard.TransformationWizard and org.eclipse.papyrus.interoperability.rsa.transformation.ImportTransformationLauncher) as a standalone application but I faced some problems (described here). That is why I am trying to implement the reading of the .emx model file from scratch. I checked the stacktrace and implementation of the Connector element and I concluded that for the field "kind" one of the valid values is "assembly", but the exception says the opposite. So, I was thinking may be somebody already knows how to solve this issue or at least what is the real problem. As you can see from my first post in a few lines I am including missing nsURI's, which I indeed got partially from C:\GIT\org.eclipse.papyrus-interoperability\rsa\plugins\org.eclipse.papyrus.interoperability.rsa\plugin.xml file. What about content type declarations? Where can I get it? Not everything is used right now but like I said I am trying different ways. For the exception itself, I believe (I'm pretty sure) that it is because the *.emx file is not loaded in a 'UML302UMLResourceImpl' Resource (The resource that is responsible for converting UML2 3.x models - used by RSA - to UML2 5.x - used by Papyrus). 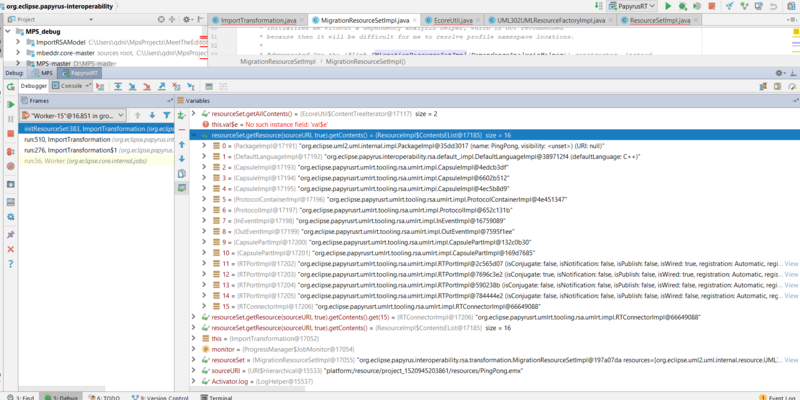 Why in this case in Papyrus-RT import RSA model it uses MigrationResourceSetImpl? Shouldn't I use the same? I will continue investigating how I can read the model in standalone application. Any help is appreciated. Initializing UML for standalone usage used to be a nightmare, particularly for legacy functionality. The UMLResourcesUtil.init() functionality solves this. I recommend ensuring that whatever is necessary to make this work with IntelliJ is done. Your code should not mention any UML version specific classes such as UML302UMLResource. By default, UML Initialization won't recognize *.emx files, no matter what (Because UML content types, which are used to determine which resource class should be instantiated, are only associated with *.uml, *.xmi and a few other standard file extensions). Yes. UMLResourcesUtil.init() won't register *.emx, but it will register everything to do with UML in particular all the content types that allow multiple dialects for the one *.uml extension. Playing with the attached PingPong.emx, it appears to be a standard *.uml file with a http://www.eclipse.org/uml2/3.0.0/UML namespace, and embedded graphical eAnnotations. Once I change the extension to *.uml, the UML Editor is happy to load it, within the limits of not having any of the imported declarations. It should be sufficient to 'clone' every line in UMLResourcesUtil.init() that has a *.uml to something functionality to do the same for *.emx. Alternatively just rename everything to *.uml. Errors such as "Value 'assembly' is not legal." are often the result of using the wrong UML dialect. I suspect that standalone you are using UML 2.5 since the http://www.eclipse.org/uml2/3.0.0/UML namespace has not influenced the UMLResource construction. You can create a miniature *.uml model with just the offending property in, and play with the xmlns:uml="http://www.eclipse.org/uml2/3.0.0/UML" to confirm this within Eclipse. What about UMLRealTimeResourceFactoryImpl()? Why I cannot use this one? Even with .emx extension. I just changed the previous resource factory to UMLResourceFactoryImpl. For now, I am having resource with all the elements from the file. When I say resource.getContents() I get a list of AnyTypeImpl objects. How can I transform all the objects according to their actual name? For instance, first element should be Package and last one should be RTConnector. But it does not work, apparently because AnyTypeImpl is not a Package. AnyType is EMF's fallback for when it's all gone hopelessly wrong. Your registrations are clearly a mess. Get them right and it should load properly. Can you be more clear please? I don't know about EMF as much as you do, this is the reason why I'm here. For example, you said: "You can create a miniature *.uml model with just the offending property in, and play with the xmlns:uml="http://www.eclipse.org/uml2/3.0.0/UML" to confirm this within Eclipse." - what do you mean by saying play? Am I using the right resource set and the resource factory? I don't get the "Value 'assembly' is not legal." error but resource.getContents() is still full of AnyTypeImpl objects. The same goes to the "cut" version of the attached model before. You can find "cut" version in the attachment. If you provide a complete example I'll try to make time to have a look, but sorry I do not have time to study fragments. In the attachment you can find the complete example of the model. The source code I already provided above. Thanks a lot for your help and time! Sorry. Where is the .classpath / MANIFEST.MF / ... ? A complete example can be imported as a project from ZIP avoiding any guessing at what you actually did (wrong). Sorry, I thought .emx file is enough. Here is in the attachment you can find the whole project. But there is no .classpath or MANIFEST.MF I think because it is RSA-RTE project. I also provided the whole java project that I use as test environment. It's called RSAModel. It is maven project made in IntelliJ. I don't really use maven because of proxy settings at my office. So, I add all the dependencies manually as jar from papyrus-rt. This is an Eclispe forum where you may receive help on Eclipse projects, not IntelliJ or RSA. You need to convert your problem into an Eclipse one. You should be aware from the earlier replies that UMLResourcesUtil.init() is very important to getting your registrations right. Once you have solved your problem within Eclipse, or presented something to allow someone to help you solve it within Eclipse, you may then have a suitable oracle for contrasting what malfunctions in other environments. Checking the UML 2.3 and 2.5 specs, the Connector::kind feature is derived, so it should not be serialized in the UML file. After deleting the erroneous element, the model loads in your program. The first resource content is a PackageImpl tree. The remainder are AnyTypeImpl which is the fallback for stereotype applications for which there is no official UML element. In the UML Model Editor, the missing libraries cause three errors. by providing a derived UMLResourceFactoryImpl that provides a derived UMLHandler that overrides setFeatureValue for the specific case of Connectior::kind or the generic case of setting a derived feature. The screenshot above is made by debugging PapyrusRT import. I am trying to reach the same. I believe that it is possible without extending and changing classes, because Papyrus-RT can do this already. It uses org.eclipse.papyrus.interoperability.rsa.transformation.DependencyAnalysisHelper to solve all the dependencies and loads my model perfectly (creates list of the objects according to the .emx file elements). I know that I can solve the problem by extending classes, process each problem situation, but this is something that I am trying to avoid, because I don't want to reinvent a wheel. I'm sorry, I really have no idea what you are trying to do. If you give me a repro I can debug it. If you just assert that it could work, then why doesn't it? If something else works then use two debuggers to see where it deviates.